Hi friend! I hope you’ve been having a wicked week! With autumn in full swing now is the perfect time to start incorporating all that delicious fall bounty into your daily diet. One of my favourite fall foods is the humble, but versatile pumpkin. It can be used in anything from pancakes, to muffins, to pies. 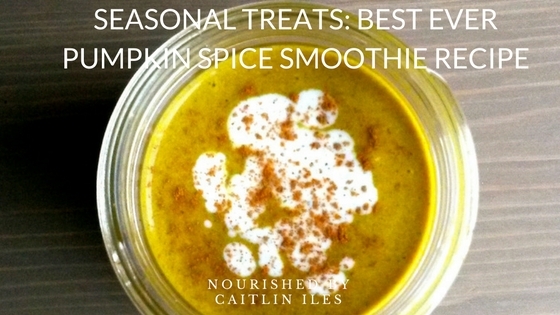 Today’s recipe takes advantage of the versatility and health benefits of pumpkin to create a smoothie that tastes just as sweet as pumpkin pie, without the added sugars, ensuring you maintain stable energy all day long! Many of the ingredients in this smoothie contain blood sugar balancing properties to prevent the spikes and crashes that lead to fatigue and food cravings. Pumpkin is a great source of beta-carotene, an important antioxidant and a precursor to vitamin A. You need both of these nutrients to help protect your cells from free radical damage and to promote immunity, respectively. The polysaccharides in pumpkin, which include a fibre called pectin, have been shown in animal studies to have antioxidant, anti-inflammatory, as well as anti-diabetic and insulin regulating properties. These fantastic properties mean that sipping on pumpkin pie can actually make you healthier! You’ll also be including a couple spices whose scent stirs up memories of holidays and delicious treats. Fortunately for your health and waistline, cinnamon and ginger add another punch to your smoothie by helping your body with the cellular uptake of glucose and by increasing your insulin sensitivity, respectively. By supporting your natural bodily processes, adding these spices means you’ll have less sugar in your blood stream and more balanced energy all day long. This smoothie is super simple to make and full of all your favourite winter spices! * Or 1 apple, diced and cored to create an apple pie smoothie! Well friend, that’s your sweet as pumpkin pie recipe for today! Don’t forget that you can change it up by swapping out the pumpkin for apple. If you’re looking for more smoothie inspiration, make sure you download my FREE Sensational Smoothies E-Book by clicking here.